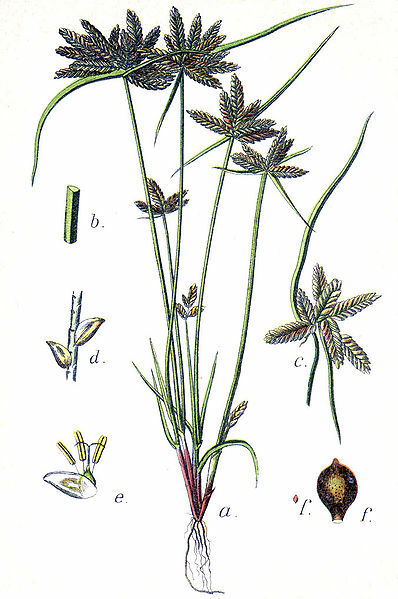 Cyperus flavescens is an annual C4 sedge (Li et al. 1999), 5-30 cm tall. Leaves short; inflorescence bracts 2-4, much longer than inflorescence. Flower spikelets 5-15, per spike, narrow, very flat, 1-1.5 cm long, about 0.2 cm wide, yellow-green, scales yellowish with membranous margins, about 0.2 cm long. Fruit an achene, lens-shaped, black with minute white lines, 0.1 cm; flowering stalks 1-5, to 4.5 cm long; blooms and fruits July-Oct.